Friday: Mardi Gras Parade 4:30pm, Pasta Dinner at the Legion Hall 5:00pm, Movie at IL Theater 7:00pm. Saturday: Breakfast at the Firehall 7:00-10:00am, Snowarrior Poker Run starts at Byron Park 9:00am, Craft Fair at IL School Cafeteria 10:00-3:00pm, Book and Bake Sale at the Town Hall 10:00-2:00pm, Roast Beef Dinner at the Methodist Church 5:00pm, Gallery Reception and Dance Party at Adk. Lakes Center for the Arts (Blue Mountain Lake) 5:00pm, Tricky Tray at IL School Gym doors open at 6:30pm, Movie at Indian Lake Theater 7:00pm. Sunday: Breakfast at the Firehall 7:00-11:00am, Games and Fun for grade school age kids at the Ski Hut 1:00pm, Make Your Own Sled Races on the sliding slope at 3:00pm, Jalapeno Eating Contest at Marty's Chili Nights at 3:00pm, Bon Fire, Torch Run and Fireworks at the Ski Hut 6:30pm. FREE skating, skiing and sliding all weekend and during President's Week on Tower Hill, weather permitting. 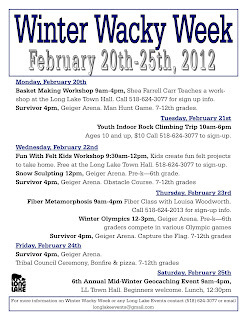 For a full week of events, Long Lake is having a fun Winter Wacky Week, February 20-25, 2012 that is open to all from basket making workshops to Fun with Felt. 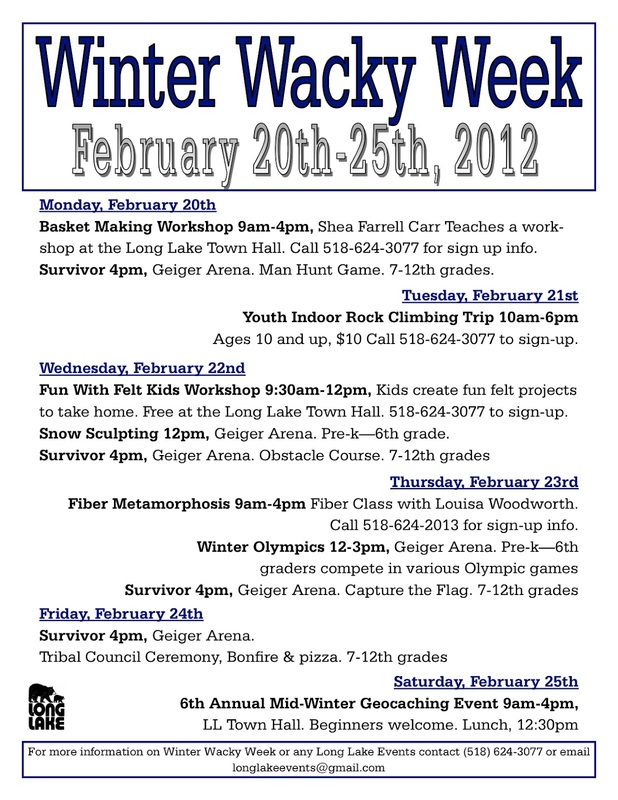 There will be Winter Olympics at Geiger Arena and a Survivor week including a Tribal Council Ceremony on February 24th!